A colorful bilingual picture book that introduces numbers and Mexican traditions. 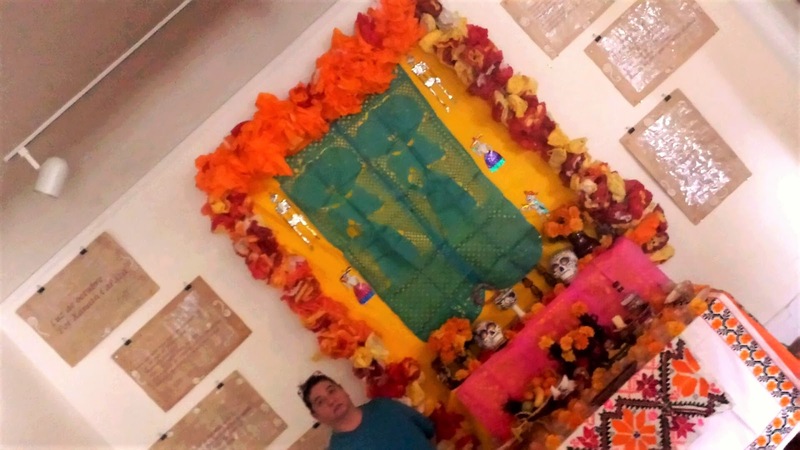 “I love pan de muerto,” Joaquín says as he and his mother sit down to eat the special Mexican sweet bread prepared especially for the Day of the Dead. But someone knocks at the door just as they are about to take the first bite of the pastry. 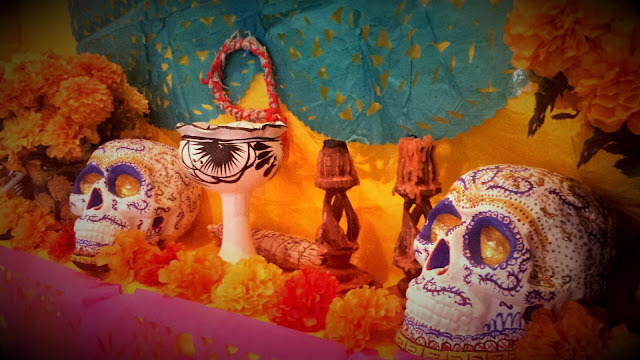 Standing at the door is a hungry skeleton dressed in a mariachi suit who offers to sing Joaquín and his mother a song in exchange for just one itsy bitsy little bite of the sweet bread. It seems like a fair exchange, so they agree to share. But before the skeleton can begin singing, two more knock at the door and offer to play their accordions for just one bite of the bread. And then, three show up and want to play their guitars, four want to play their maracas and five want to dance—all for just one itsy bitsy little bite of the Mexican sweet bread! Award-winning children’s book author Xavier Garza collaborates with illustrator Flor de Vita to create an engaging introduction to numbers and the Mexican cultural traditions of the Day of the Dead, mariachi music and sweet bread. 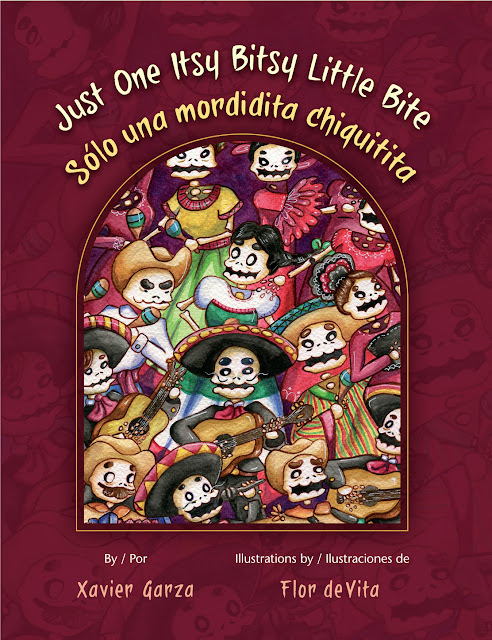 Children ages 4-8 will want to pair this entertaining book with their favorite pan dulce! XAVIER GARZA is the author of numerous books for kids, including Zulema and the Witch Owl / Zulema y la Bruja Lechuza (Piñata Books, 2009), Juan and the Chupacabras / Juan y el Chupacabras (Piñata Books, 2006) and Lucha Libre: The Man in the Silver Mask (Cinco Puntos Press, 2005). He lives with his family in San Antonio, Texas. FLOR DE VITA was born in Veracruz, Mexico, where she found her passion for painting and writing, influenced by nature, Mexican traditions and the folktales that she heard from her mother while growing up. She graduated from Instituto Tecnológico y de Estudios Superiores de Monterrey with a B.A. in Animation and Digital Art. She currently resides in Jalisco, Mexico. The neuroscience researcher was describing a way to measure short-term memory using an n-back visual test. Numbers appear on a monitor over a period of time, and the test is how many back you remember. He was saying how it’s OK to have an N of 3, but imagine those Cal Tech undergrads. Parts of the lecture went way over the heads of his in-one-ear-out-the-other, ditzy, absent-minded audience. We're a “Memory Club,” hosted by Huntington Senior Care Network in Pasadena, in association with Alzheimer's Greater Los Angeles. Many such services exist across the country. We're an aging country and we're all aging ten years a month until 6November. Half the researcher's audience today experiences cognitive dysfunction and the other half experiences experiencing cognitive dysfunction, as caregivers. Some of us have an N of zero. All of us are scared witless. I know exactly how dementia feels. 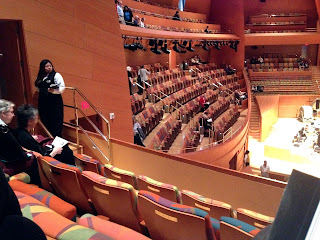 A few years ago I sat in Disney Hall at a John Williams concert. Williams conducting Williams and all the familiar tunes. In the moment I realize I no longer know Star Wars music. Odd. I hurried home and sat at the keyboard to play a piece I really like. And sat there. My hands poised above the keyboard, my eyes stared at the keys with no idea what to do next. Damn, that hurt. Next day, I took the bench again and forced my hands to play what I imagined was the Rage Over A Lost Penny and out came my 5th grade recital piece, Comin’ From The Jam Session. I attacked American Patrol and out marched Comin' From The Jam Session. My fingers remembered one piece, from más antes. I read the heck out of a page of music, and improvisation was no sweat, but the pieces that were important to me, the ones I knew, were gone. I rewired over a couple years, now I've recovered a bunch of stuff. I can almost play Beethoven again. But arthritis, sabes? It’s frustrating knowing that there's a lot of stuff I don’t know any more. I have look up simple stuff. Like the neurologist told me, yeah you lost a shitload of stuff but you had a lot to begin with. I paraphrase. So I shared the envy those cognitively disabled old folks--one is 57--must have felt for a fleeting moment there when the neuroscientist told us about kids playing with their memories, reaching into themselves for an N of 9. And did you know that a lot of migraine sufferers get diagnosed in later life with dementia of the Alzheimer's type? People sit up at the table when he says that. This researcher is the fellow who unraveled the DNA sequence causing Mad Cow Disease. He hopes none of us get that. Me, too. He’s a researcher, not a healer. He wants to know how migraines work. He wants to know how memory works. He dissects brains to learn. You know that thing about plaque and Alzheimer’s? Some people’s brains were loaded with plaque and they didn’t have cognitive impairment. Others were treated by a drug that cleaned out all the plaque. They weren’t cured. I was reading Emma in 1964 it must have been, and came across this word I’ll never forget but held at arm's length. Now most of my friends and I exhibit similarities to Emma’s uncle, the valetudinarian. How is your memory, by the way? Start working with it now, the researcher advises. If you get hit, you get hit. Punto. Maybe you can delay it. He says. The other day I had lunch with a friend I’ve known since elementary school. He has no short-term memory but he’s otherwise totally functional. They're from out of town. That couple has to keep after their local neurologist to be on top of developing therapies. Approaches and chemicals rapidly change. An eternal spring, hope. People must be their own patient advocate. I stood facing my friend of so many memories, made eye contact and found him in there. “Don’t let this be the last time I see you,” I told him. He promised. None of us wants to see ourselves as growing older too fast, I think, so eat right, exercise, hold onto your memory, and GOTV. The majority of people in the aging study are anglo women. They live longer than their men. There's a montón of raza with cognitive health problems and science has N=0 worth of data on our gente. Posted by msedano at 12:00 AM 5 comments. Click here to leave a comment. Unir el pasado y nuestro presente se concentra en el Writers Place cada año desde el 2010. La celebración de Día de muertos se convierte en un puente entre tradiciones indígenas ancestrales de México y colores, aromas y, en especial, poesía de nuestra cultura Latina/Chicana en Kansas City. 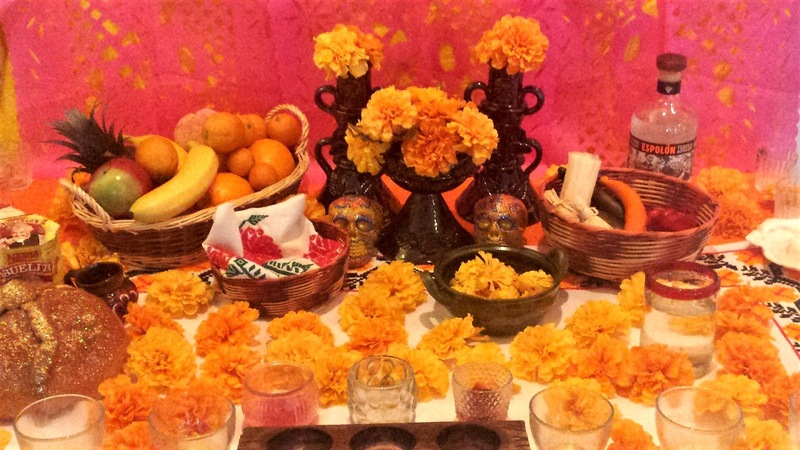 No se me ocurre una mejor manera para celebrar Día de muertos. 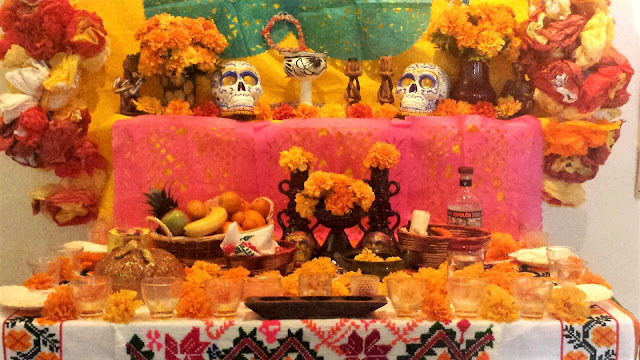 Me parece que Kansas City está creando una mezcla cultural radiante donde honramos a nuestros muertos con su comida favorita en el altar, donde la poesía nos envuelve como humo de copal y las cempaxóchitles conectan esta ancestral celebración con nuestro presente. En el corazón del medio oeste nos reuniremos por novena ocasión, el viernes, 2 de noviembre de 2018 en punto de las 7 p.m. en el Writers Place para celebrar la vida y honrar los ancestros, a nuestros seres queridos que ya no están con nosotros y, en mi caso particular, a las víctimas de la Sinagoga Tree of Life. Mi altar está dedicado a estas víctimas. Nos acompañaran en esta ocasión, Maryfrances Wagner, Delia Carmen Perez, Steve Holland, Isabel Izydork, Andrés Ramirez y Arelis Flores con Calpulli Iskali. Tendremos como nuestra invitada especial a la escritora y poeta, Jan Rog. 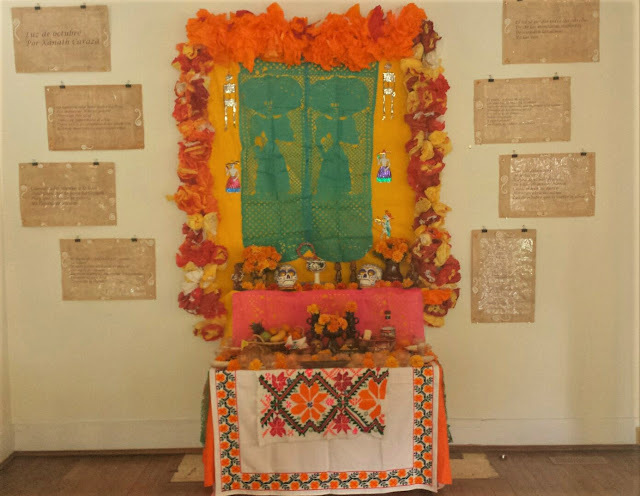 A continuación, queridos lectores de La Bloga, una biografía de Jan Rog y algunas fotos de mi altar con poesía en papel amate a los lados de éste, mi poema “Luz de octubre / October Light” de mi poemario Conjuro (2012) para celebrar Día de Muertos de 2018 en the Writers Place en Kansas City. There came a point when Jan Rog needed to start making public the words she would write privately, free from risk but also free from growth. Once she began, a creative non-fiction story about healing and a poem about teaching were published in different issues of Still Point Arts Quarterly. Active in both the Greater Kansas City Writing Project and Prairie Lands Writing Project, Jan works with other teachers from throughout Missouri, and these collaborations and opportunities led to publication of poems in Scintilla Magazine and The 2017 Poetry Marathon Anthology. Her favorite contributions have been working with students in literary festivals, summer camps, writing retreats, or the old-fashioned classroom. As a literature developmental composition teacher at MCC-Longview, she encourages inquiry, active dialogue, and ultimately love of learning in her courses. Daily writing is part of all her classes, and -- technology, time, and lesson planning permitting -- she writes alongside students, trying to keep a bit of humor and hope as they loop letters together. Imagine sitting among a group of people at a long, beautifully decorated table, set for a sumptuous meal, surrounded by gorgeous art. The artist is present, the guest of honor. She has just given a mini-lecture on the themes and craft of her work, and now, the dinner conversation continues to explore the topics she has laid out. Such a setting actually happened this past Friday, October 26th, at the Weinberger Fine Art's Drawing Room in Kansas City, Missouri. The theme of the evening was the title of Nancy Friedemann-Sánchez's latest art works: Cornucopia. Artist, Nancy Friedemann-Sánchez, speaking on her latest art work, "Cornucopia"
On this evening, there were 60 guests who had the privilege of getting to know Friedemann-Sánchez, and to understand her work in a way that would not have happened without her mini-lecture and the conversations that ensued. At a time when the sound bite dominates over more nuanced and complex discussions, providing a space and the time to delve into the various aspects of an artist's work is refreshing and so necessary, even activist, in order to challenge our present moment in history. Nancy Friedemann-Sánchez: My work combines the Latin American, Asian, African, and Indigenous cross-cultural connections, and that is at the crux of what interests me, of who I am, of my own DNA, in everything that makes my world, OUR worlds, because we are all from these big continents. These flowers: they come from a pre-Columbian technique called "Mopa Mopa" and "Mopa Mopa" was in existence before the arrival of Columbus and is still practiced because the indigenous groups have survived and are still there. 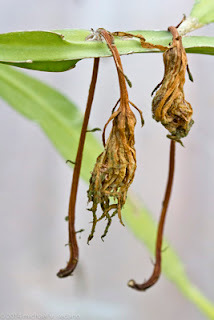 (Link to a further explanation of Mopa Mopa technique) The natives took the flowers and the seeds from these flowers and would boil them. Then they would stretch the material and place it over objects. You see them in Peruvian and Colombian objects that date some 800 to 1,000 years. When the Spanish arrived, they were wowed by the art. They thought it looked like the Chinese Lacquer that they loved and had brought to the courts in Europe which was very expensive and difficult to get. So they imported some of these objects and asked artists, "can you do this?" What happened, then, was a hybrid, a syncretism of all of these cultural forms. And I'm interested in that. I'm interested in reaching into that history and using some of our contemporary themes that we live with in our every day existence. So what I do is I look at these historical images and I go to the studio and I paint them. 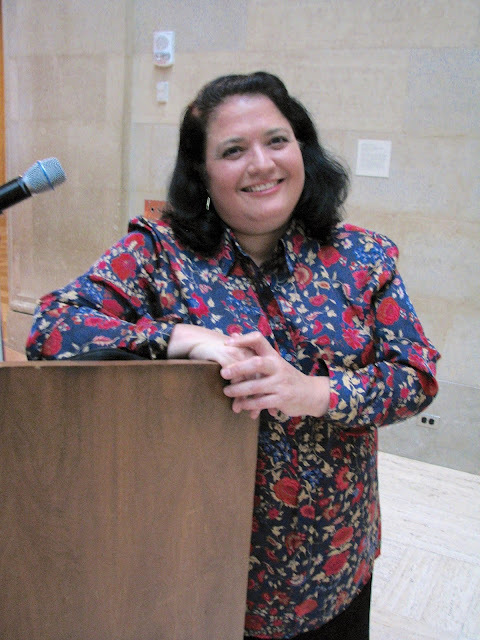 Nancy Friedemann-Sánchez at her studio in Lincoln, Nebraska. Her work table is full of the many flowers she has researched and painted, readying them to place as a collage on her canvas. Nancy Friedemann-Sánchez: I'm not using a resin but I'm using a collage just like the Mopa Mopa technique, just like how the work was done 800 to 1,000 years ago, and I paint each individual one. Each one is separate. I have a huge stack. I'm always looking at various books regarding the influence of Asia and the Americas in the 1600s, in the 1700s. I find it, I photograph it. If I can't find the object, I'll photograph the object from the book, or a picture in an art book, a history book, so each piece is carefully researched. It is not invented. I do not say, "Oh, I like this flower and I'm going to paint this flower." Each one has a historical record that dates back hundreds of years so some of them, for instance, have a strong Asian history. The black background, of course, makes you think of the Chinese Lacquer, but it is also invoking the Spanish baroque painters, as well as the Indigenous artists. I'm invoking the Indigenous and the Spanish, the African, and the Asian. I'm also including drones and the figures who are threatening our environment, the diversity of our peoples, our cultures-- our present day. So I paint all of this in the studio-- with ink. I paint them, and then I cut them, making these large images of beauty. From far away, this painting looks idyllic: the flowers colorful and abundant, the birds flying. But close up, one can see a different story taking place. Tiny figures are threatening the flowers and wild life. Note, however, how the figures are smaller, the foliage, massive and powerful. In this detail, you see a drone flying in to attack. The menacing aspect to Friedemann-Sánchez's work shatters any kind of romanticism that may be attached to it. Her paintings, then, reveal themes of resistance regarding war, the environment, the patriarchy. She takes all of these "found objects" from history to then speak to the viewer about where we find ourselves in our moment in history. Friedemann-Sánchez's models for this project were all Latinas. She imbues their forms with historical flowers while placing an indigenous mask as the face adorned with a Spanish "peineta" atop each head. The "peineta" is a traditional Spanish comb. Here is a hybrid once again of the colonizer and the indigenous. Also noted are the models movement, how the viewer sees the body. It seems to be moving due to the lighter outlines. There is a "shadow" form behind the more prominent one: a reminder that, once again, there is more to what is on the surface. The form is also androgynous and therein brings yet another aspect to Friedemann-Sánchez's feminist themes of the intersections among and between gender/sexual identities. Within certain indigenous communities in Latin America, the androgynous individual was often considered holy and/or gifted. Nancy Friedemann-Sánchez and Kim Weinberger discussing her work. 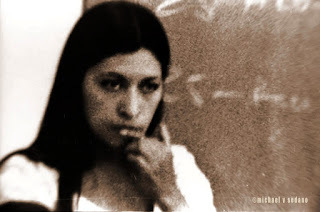 Nancy Friedemann-Sánchez's work is what feminist writer and theorist, Gloria Anzaldúa describes as "work that matters" because it is socially, politically, and universally reflective. It contains various movements that take the viewer to diverse historical, and cultural moments ultimately returning to a more complex recognition of hybridity. You can view Nancy Friedemann- Sánchez's work at Weinberger Art Gallery in Kansas City, Missouri. You can also contact Fiendish Plots (link here) to inquire about other galleries where Nancy Friedemann-Sánchez's work is on display. Gracias, La Bloga readers! Abrazos to you all! Portrait of a "Bonus Baby"